If you were going off of movies alone, it would seem that we modern-day internet-dwelling humans — who have forsaken brick-and-mortar stores, physical media, and the anxiety-triggering act of walking three cubicles over at work to ask someone a question in favor of their digital alternatives — desperately wish the internet was a place. In last year’s abomination The Emoji Movie and now in the Wreck-It Ralph sequel Ralph Breaks the Internet, assigning space and velocity and depth to the activities that have been rendered for the most part abstract to us in 2018 constitutes a good amount of the creative energy expended. It’s a way to get around the long-held stumbling block of the inherent cinematic boringness of watching people do things online, but more or less requires the absence of human bodies altogether. We know too much now about the absurdity of life online to be able to identify as kinetic entities like Neo or Trinity doing backflips over the information superhighway. At most, we will exist as a little blockheaded avatar, or a hand, or a face, or a pile of excrement. Wreck-It Ralph was a movie about, among other things, the feedback loop between one’s work and identity. In a sense, it was a depiction of a kind of a post-capitalist utopia. The arcade games in which its characters report for duty every day are both a workplace and a home — the threat of losing one’s game is an existential one. But because these characters are ostensibly little clusters of ones and zeros that don’t need to eat or sleep or stay warm, it is not a financial one. A loss of a game-job is a loss of a stimulating activity, a meaning, a purpose, but not a means of physical survival. Characters long for bigger roles or bigger responsibilities not to enrich themselves, but because of how it might change their picture of themselves. Notably, once Ralph (John C. Reilly) and Vanellope (Sarah Silverman) enter the internet, money comes into the picture. After an idyllic intro where the two best friends while away their days in their familiar realm, their peace is interrupted by the arrival of Wi-Fi at Litwak’s Arcade. (There’s also an encroaching economic anxiety in the glimpses of meatspace we get; we see the elderly Litwak trying to make sense of the Ethernet port on his Bondi Blue iMac, a forlorn “NOW WITH WIFI” spelled out on the reader board above an empty parking lot.) Meanwhile, Vanellope’s role as a driver in the fictional racing game Sugar Rush, which she fought so hard for in the original film, is starting to bore her. (Imagine that!) Ralph’s efforts to build some excitement into the game for her get it shut down, and soon the entire cast of Sugar Rush is gameless — homeless and unemployed, left to languish in Game Central Station or drown their sorrows at Tapper’s (Root Beer) Bar. Ralph tries to cheer up Vanellope with the idea that she could just hang out with him all day doing nothing, but this is no consolation to her — her job was her life. So she and Ralph decide to find a fix for the game via Litwak’s Wi-Fi connection, and find themselves in the overcrowded, fast-paced metropolis of the internet, under gleaming towers adorned with the logos of all your favorite Silicon Valley corporate entities. Most of Ralph Breaks the Internet — and the actual breakage referred to in the title — comes down to money. The duo needs to find a steering wheel to replace the broken one in Sugar Rush, and as mere economic children coming from a land where everything operates on quarters, they soon find themselves $27,0001 in debt from an eBay auction gone awry. To pay it back, they first fall into a “make money playing games at home” scam, then get the brilliant idea to capitalize on Ralph’s nostalgic celebrity and turn him into a YouTube (er, “BuzzTube”) star, vacuuming up hearts handed out by bouncing, dead-eyed avatars, and turning them into cash. Meanwhile, Vanellope has become enamored with an online game called Slaughter Race, a kind of Grand Theft Auto open-world hellscape lorded over by the glamorous stunt driver Shank (Gal Gadot). 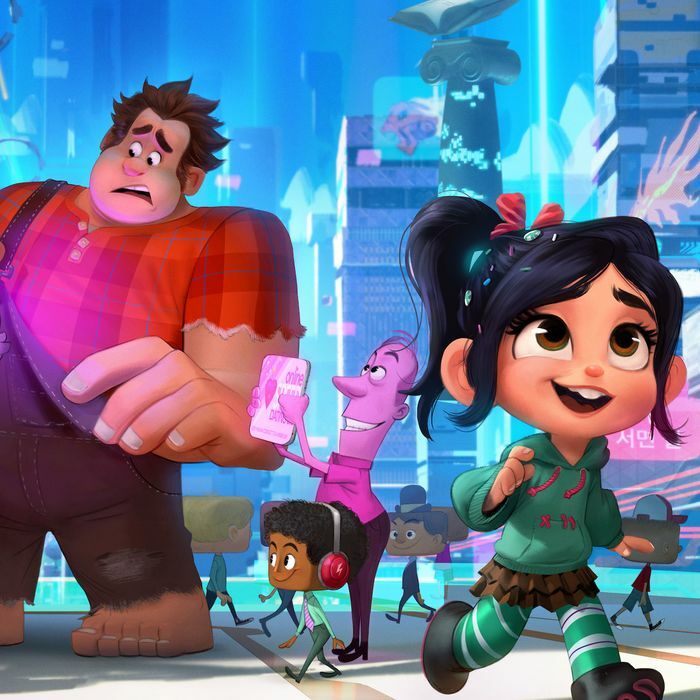 As Ralph debases himself so that Vanellope can return to her little life back in the small town of the arcade, she starts to imagine a life in the big city of the internet — and away from him. Wreck-It Ralph — the character, not the movie — is a kind of loose metaphor for a cocktail of personality disorders; he works as a character because it’s so easy to see shades of ourselves and our friends in him. He’s a fundamentally gentle soul, but his sense of self is critically unstable without external validation. Those giant hands tip us off to a kind of inborn destructive grabbiness, the self-annihilating need for the love of others. (John C. Reilly was the only real choice to ever play this character, and he is once again perfectly deft at capturing that stubborn, restless feeling of inadequacy.) It’s absolutely perfect that he becomes a social-media star, and when his (literal) insecurity is exploited by a rogue virus, and multiplied to infinity, the metaphor comes full circle. If Wreck-It Ralph was a film about jobs and self-image, the addition of commerce into that equation in its sequel makes everything exponentially more manic and unstable. And after nearly two hours of our eyeballs being flooded with savvy, incessant product placement of eBay, Amazon, Pinterest, and of course the entire Walt Disney Company portfolio, we’re all wrecked. Ralph Breaks the Internet has been nominated for a 2019 Oscar in Best Animated Feature Film.